Bio: I’m a post-doc working at NASA Jet Propulsion Laboratory on deep-sea hydrothermal vents systems. I use stable isotope methods to disentangle the food web, and trace carbon, nitrogen and sulphur pathways, around hydrothermal vents at the Mid-Cayman Rise. My broader interests range from biomineralisation to palaeoclimatology and archaeology. I write my own blog at http://silentwitnesss.wordpress.com/ and occasionally tweet as @emmaversteegh. One of the nice things about Sacramento is that, unlike LA, it has real rivers, with water in them and levees along them. This week I enjoyed a few beautiful morning runs along the American River, where there is a bicycle path on the levee. I almost felt at home! As there were no oral sessions on Wednesday afternoon, we took the opportunity to explore the area some more and went to Folsom Lake, a reservoir in the American River about 40 km northeast of Sacramento. The on-going drought was very visible in water levels about 15 m lower than normal. Still, it is a beautiful area, and swimming was great. Today’s plenary speakers Andrea Foster and Christopher Kim spoke about “The Environmental Legacy of California’s Gold Rush: Arsenic and Mercury Contamination from Historic Mining”. They noted that Thursday might be too late in the week to warn us for the widespread contamination with Hg and As. Indeed, reading up on Folsom Lake I found out it flooded a mining town, Mormon Island, which has recently been exposed for the first time in 55 years because of the drought. Assuming the mine and its tailings are also under that lake, I might indeed have had second thoughts about swimming! However, apparently it is safe to eat the fish caught there, so I’m not too worried. Goldschmidt in California meant a drive instead of a flight. The route from Pasadena to Sacramento lead us through the Central Valley of California. While living in greater LA we have been well aware of the drought going on in this state, it was still quite sad to see the many fields transformed into desert, and almond plantations dead and cut down. We also saw the thermometer steadily go up to a balmy 43 °C. Monday was mostly a day of talks on the solar system. Starting off with Andrew Westphal talking about fluffy interstellar particles, and Meenakshi Wadhwa showing that the Solar System originated in an active star forming region, it was very interesting to learn about the latest science coming from the Curiosity Mars Rover, during the plenary by Pamela Conrad. David Blake had a great follow-up on this with his keynote on the mineralogy of mudstones at Yellowknife Bay, Mars. Who knew that the best Earth-analog for these mudstones is also the entrance to the Bat Cave! Today’s session on Coastal Archives of Climate Change was one of my highlights so far. Very interesting catching up with what has been happening in sclerochronology and related fields. Howard Spero showed some beautiful seasonal isotope records of oyster shells from Jamestown, Virginia, the first permanent English settlement in the Americas. Heather Black also spoke about oysters, but showed human influence in historic nitrogen isotope records. Goldschmidt is also the conference where there are always lots of people that look at biomineralisation in great detail. This afternoon’s keynote by Susan Stipp was an excellent and engaging presentation on why this is relevant, and how some of the regulation on mineralization by organisms works. For my own session and presentation I still have to wait until Thursday evening (posters) and Friday morning (orals). In the meantime there will be a lot more exciting science to hear about. 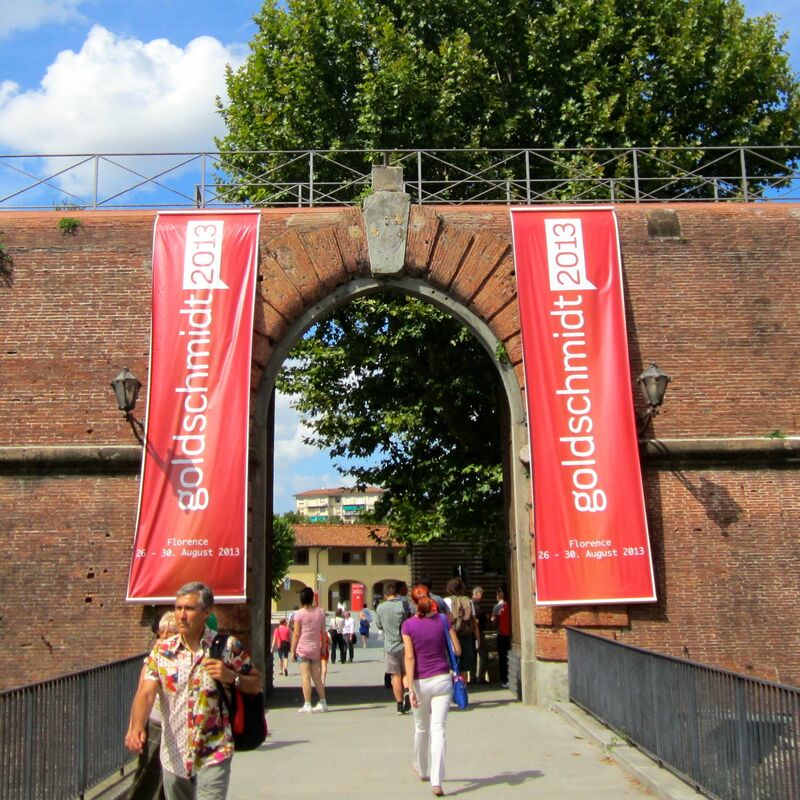 You can follow some of it on Twitter #goldschmidt2014. After four days of Goldschmidt 2013 my brain had reached geochemistry saturation state, so I figured it was time for some tourism. Earlier this week I had only ventured into the city in the early morning, and I only now realised how peacefully quiet it had been. Florence is a virtual ants nest of tourists and the people trying to sell them things; not my favourite habitat. I did manage to get a ticket for the Uffizi Gallery without too much queueing and spent a while looking at beautiful and some famous paintings, such as “The birth of Venus and four portraits by the Dutch 17th century master Rembrandt van Rijn. Of course I had to see the Museo Galileo as well. Lots of fascinating scientific instruments, globes, clocks and what have you. Too bad they didn’t sell any replicas in the museum shop. Thomas Tütken showed us that the fearsome Eocene terror bird was neither a predator, nor a worm-catcher, but a gentle herbivorous giant instead! Also the oxygen isotope composition of the bones of large herbivores forms a remarkably good archive of Cenozoic climate, agreeing well with the famous Zachos curve.